(CNN) The scene is terrifying — entire sections of a Mexico City office building fall away and crash to the ground. The screams of people reacting are almost worse. That moment, captured on cellphone video, shows just one of a number of buildings, from apartments to schools to governmental offices, that collapsed during the 7.1 magnitude quake that hit Mexico on September 19. “I’ve seen that video,” says Mark Schlaich, vice president of engineering at Los Angeles-based Alpha Structural Inc. “It’s what we’re trying to prevent here.” Schlaich waves at the central Los Angeles multistory apartment complex he’s standing under, a pre-1978 wood-frame soft-story building — so-called because the first story is substantially weaker and more flexible than the stories above it, lacking walls or frames at the street level, usually reserved for parking spaces. Alpha Structural is retrofitting the apartment complex’s ground floor, installing much thicker steel beams and columns, rebar and heavier plywood. In a 2008 study, the US Geological Survey found there’s a greater than 99% chance of a 6.7 magnitude quake or larger hitting the California area over the next 30 years. That type of quake along the San Andreas Fault in Southern California could kill an estimated 1,800 people, the study said, injure 53,000 and result in $214 billion in damage. California’s infrastructure could be crippled for weeks, if not months. In a stark recognition of those numbers, in October 2015, Los Angeles enacted the nation’s most sweeping seismic regulations, requiring about 14,000 buildings to be retrofitted so they will withstand violent shaking. The apartment building Alpha Structural is retrofitting is one of those city-identified vulnerable buildings. Schlaich points to a new steel column next to a clearly smaller, older column. The steel column goes 5 feet into the ground, plus 2 feet of additional concrete below it. “This column keeps the people alive, so the building won’t collapse,” explains Schaich. The only problem with the retrofitting in Los Angeles, say seismologists, is the expensive process is happening too slowly, expected to be complete in 2022. In San Francisco, a similar city law for retrofitting soft-story buildings was enacted in 2013. Rolling out in four phases, San Francisco has seen compliance at near 99% for phase one and two, and above 85% for phase three, says Bill Strawn, spokesman for San Francisco’s Department of Building Inspection. The fourth and last phase of retrofitting the city’s soft-story buildings wraps in September 2018. Strawn says once complete, the building collapse rate substantially improves in San Francisco. “We go from an estimated 1 in 4 collapse rate of these nonretrofitted buildings during a quake to 1 in 30. And that’s with minimal retrofitting,” says Strawn. 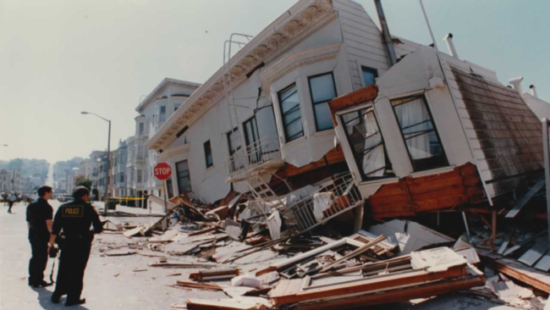 The 2008 study estimating damage at $214 billion was based on the state of buildings at that time, and efforts to retrofit buildings at the city level “undoubtedly change the statewide damage estimates,” says geophysicist Doug Given, who serves as the earthquake early warning coordinator for USGS. The Earthquake Early Warning system, as it’s called, is the best available technology to give seconds’ — at times, minutes’ — notice that an earthquake is coming. It would use seismometers buried underground to detect shaking crucial moments before it’s perceptible in all the areas that will experience the quake, and sensors distributed across the West Coast capture the data in real time. The most beneficial part of those 30-60 seconds, says CalTech engineering and seismology professor Tom Heaton, is simply the heads-up. Children can get under desks or move to safer areas of the school. Surgery can stop. Trains can come to a halt. “This system is to provide as much information as is possible so you can make the best decisions during the earthquake,” says Heaton. In the Mexico City quake, the early alert system warned people up to 30 seconds in advance that an earthquake was about to hit, allowing them to flee vulnerable buildings or move to safer areas. Mexico put its robust warning system into place after nearly 5,000 people died in the 1985 Mexico City quake. An early warning system has also been in place in Japan for decades. Today, cellphones and school alarms ring in unison when a quake is about to hit, a high-tech system installed after the Kobe earthquake in 1995. But in the United States, the early warning system is in development, stalled due to federal funding constraints. USGS says only 40% of the necessary sensors for the EEW system arein the ground. USGS and the CalTech Seismological Laboratory started research on the EEW in 2006 with a thin budget, relying on federal funding and some private donations. In 2012, they went live with a beta system, and earlier this year rolled out a pilot program to train systems and some utilities. This year, underscoring the lack of national urgency for an EEW, the Trump administration initially budgeted nothing toward the USGS EEW system. Bipartisan demands by members of Congress tentatively restored the USGS EEW funding to $10.2 million for this year, although Congress has yet to vote on the budget. The state of California last year also allocated $10 million to developing the EEW system. But USGS says the EEW system will cost roughly $38 million to build and $16 million a year for operation and maintenance. More than 100,000 people — even as many as 300,000 — could be displaced if a major earthquake were to hit Los Angeles, estimates Aram Sahakian, general manager for the Los Angeles Emergency Management Department. As cities and states try to prepare for the Big One, seismologists and city officials also recommend being prepared at a personal level.